An opera that uses the figure and the feats of Julius Caesar to address the mechanisms of power, self-congratulation, mass seduction and war in a gentle tone. In places it almost resembles an opera buffa, but there are moving and dramatic moments too. The libretto is adapted from Commentarii de bello gallico, one of the most famous books of all antiquity, Consul Gaius Julius Caesar’s firsthand account of the long series of campaigns he fought from 58 to 49 BC to conquer Transalpine Gaul. In the aftermath, he became one of the most celebrated, admired and feared men of his time. Twelve years of war, in fact, not only led to the conquest of a huge territory, rich in resources and men, but also earned the general one honour after another. We might even be tempted to think that Caesar, still a consul, was already planning to use the conquest of Transalpine Gaul as a springboard for achieving even greater power. The fact is that he subsequently found himself projected by his successes towards absolute power and leadership of the ancient world. De Bello Gallico is, at once, a celebration of the condottiere’s exploits written in the spare language of a military report and the text that established the greatness of the future dictator perpetuus of Rome as one of the most famous historical personages of all time. But also, alas, as a model for many of the dictators who where later to tread the historical stage. In the opera Caesar embodies two figures alternately. The first is the Caesar of tradition, the historical personage, the unscrupulous politician who is building an image for himself by telling the story of his deeds. He addresses the audience directly, declaiming from a sort of podium, like the ones used by contemporary politicians but also the plinth of a monument from which the character protrudes like a marble bust. 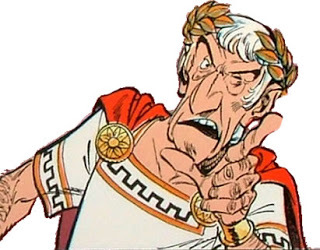 The second is Caesar the human being: vain, intelligent, a clever manipulator, ruthless with his enemies – but also with any Romans who are not faithfully on his side – keenly engaged in alliances and intrigues, impassive but neurotic, a victim of splitting headaches. This second Caesar does not use the third person or the past tense, but lives in and relates a present charged with tension, danger and urgency. When he drops this ‘official’ guise, he leaves the monumental podium to speak and argue directly with the chorus, recounting the events of the wars in the present as if they were happening before his very eyes. Like a flashback in a film that becomes so vivid it morphs into a kind of hallucination. Moving around the leading player, the male chorus represent alternately his multitudinous legionaries (epitomized by his beloved Tenth Legion), indefatigable fighters, amazing engineers, highly disciplined, deadly soldiers, and the Gaulish masses who Caesar defeated, humiliated and ultimately wiped out. On stage with them is a soprano, an Allegorical Figure who surprises everyone by representing different characters – from Fortune to Glory to Rome to others besides – according to circumstances. There is also a tenor. In the first act, he plays Caesar’s scribe, Aulus Hirtius, whose job it is to write up De Bello Gallico. In the second act, instead, he takes the role of Vercingetorix, first an icon of Gaulish resistance, then a slave in chains by Caesar’s tent.